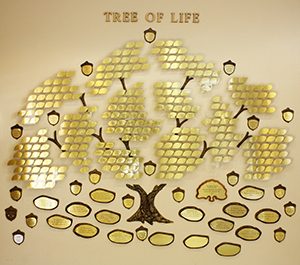 The "Tree of Life" within the hospital has been generously donated by the TRH Auxiliary Volunteers and enables you to honor or memorialize someone in your life while also providing a donation to the hospital. Throughout the ages, trees have stood as a symbol of life. The branches on our Tree of Life sculpture symbolize the way Taylor Regional Hospital reaches into our community. The Foundation Stones represent the heritage on which our hospital was built and the current vision which guides our mission and future. The Stones, along with the Golden Acorns and Golden Leaves, may be inscribed to honor, highlight, commemorate or memorialize significant individuals and events that touch and illuminate your life. Your gift is tax deductible. The Walk of Hope was also created to honor or memorialize individuals who have impacted your life while also providing a donation to the Hospital. The Walk of Hope is located at the front entrance of the Hospital.